Beyoncé, Jay Z, Nicki Minaj, 50 Cent and many more celebrities turned up to watch the Floyd Mayweather vs. Manny Pacquiao fight night. 1. 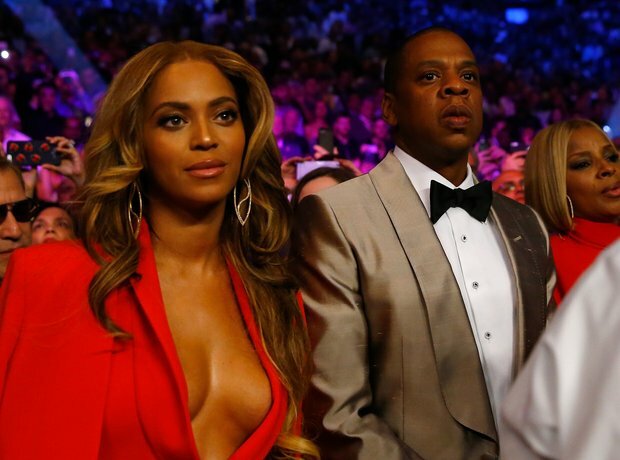 Beyoncé & Jay-Z headed to Vegas to watch the big Floyd Mayweather Jr. v Manny Pacquiao fight. 2. Beyoncé looked red hot as she dressed up in a low-cut jumpsuit for the big night. 3. Nicki Minaj andnew fiancé Meek Mill also made their way to the MGM Grand in Vegas. 4. Backstage, Beyoncé, Jay Z, Nicki Minaj and Meek Mill posed for photos together. 5. That's two serious power couples right there. 8. Mary J Blige looked on as she sat next to Jay Z and Beyoncé for the huge event. 9. Jamie Foxx got really, really into it. 10. Then Floyd Mayweather vs. Manny Pacquiao was off! 13. Lewis Hamilton has some seriously good seats for the match. 14. Kim Kardashian and Kanye West decided to watch the fight from home.